A resurgent West Ham will look to upset the odds against six-times winners Liverpool in Saturday's FA Cup final at Cardiff's Millennium Stadium. A year after promotion, Alan Pardew's side finished ninth in the Premiership. 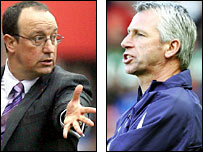 And Pardew said: "We thrive on being underdogs. West Ham are about never giving in and fighting against the odds. I hope the team represent that." But Reds skipper Steven Gerrard warned: "It is an important trophy and we have to deliver." He added: "It's my first Cup final as captain and that makes it special. We have got to match West Ham for effort and then hopefully our ability will take over. "We have beaten fantastic sides like Manchester United and Chelsea to get to the final, but it is always on your mind that after going on such a successful run you might not get over that last hurdle." Liverpool are without the suspended Luis Garcia and the Cup-tied Robbie Fowler while Xabi Alonso is a major doubt with an ankle problem, but West Ham have their own injury problems. Pardew has admitted striker Dean Ashton and left midfielder Matthew Etherington are unlikely to figure. But he added: "You expect everyone to put their life on the line for the final." Having beaten West Ham home and away this season, Liverpool are strong favourites to lift the FA Cup for the seventh time in their 13th final. History is also against the Londoners, who have been knocked out of the FA Cup five times by their Merseyside rivals. And while Reds boss Rafael Benitez insists his side's chances are no more than "50-50", Pardew realises West Ham are underdogs. "We're up against a technical team who are better than us," said the West Ham boss. "Liverpool have got more experience and more international players, too. But everyone also knows that we attack teams and that we've got a big punch." But Liverpool striker Peter Crouch insists there will be no complacency from his team. "Outsiders looking in might think it's a done deal and we've only got to turn up to win it," Crouch told the club's website. "But I can promise you we're not thinking like that. And with the manager we've got, there is no danger of us having a lapse of concentration." While Crouch will make his debut in a major final, fellow striker Teddy Sheringham is hoping for a chance to play in his second FA Cup final. The 40-year-old was a substitute in 1999 and scored the opening goal as Manchester United beat Newcastle 2-0. "I was 33 then and you think to yourself, 'thank God for that - I have got an FA Cup final under my belt,'" he said. "You don't really expect another chance after that but then I probably did not expect to be playing any football still."